Just thought this might be interesting, somewhere we could have a general light chitchat about what weve been up to. So my cars been laid up around five years now. I am getting it ready for testing and finishing the last bits on my exhaust. Today I unbolted the fuel lines from the chassis, then sanded them, they are not that bad so Ive put a coat of paint on. Ill top that up latter. 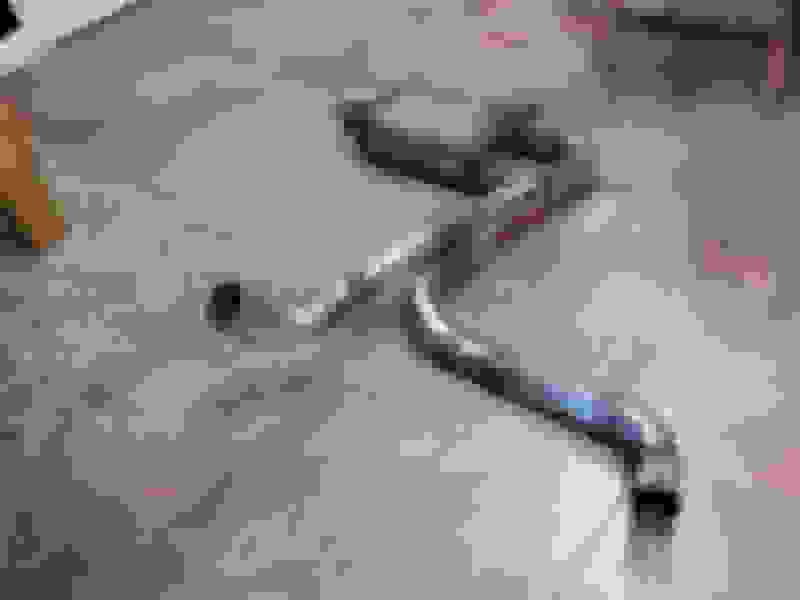 I recieved some 3" silicone intake hose to hooefully smooth some airflow out instead of that horrid big plastic box run across the rad and then the ribbed tb section. So thats what ive been up too. Nothing today, last Saturday I test-fitted the Alston SFC's which I'm planning to weld in in two weeks. I also installed the TDS wonderbar (after I had it laying around for 4 months ) and the Energy Suspension transmission mount (which was laying around for 6 months ). Today... nothing but yesterday I hooked up my n20 heater. Im tired of taking out the bottle and tossing it in the pit truck to warm up on cool days. But i do plan to go drive it arround the block today just to have a little fun with it. Yeah been looking at wonderbars, there cheap and look like a good upgrade. I cant use alston sfc cause ive put my exhaust in the way. The umi type are expensive for a bit of box, especially being accross the pond so I plan on getting my test centre to weld some box in for me along the sill line then into the frames. Not pefect I know but better than nothing. Cant wait to get mine rolling and go round the block again fasteddie :-) have fun ! After the 3.4 swap, and endless little things like the auto to manual swap, I think the tinkering is done for a minute. At this point, other than the rear and suspension, there are more new parts than old. Tracking down the bolts for my t5 and bellhousing . 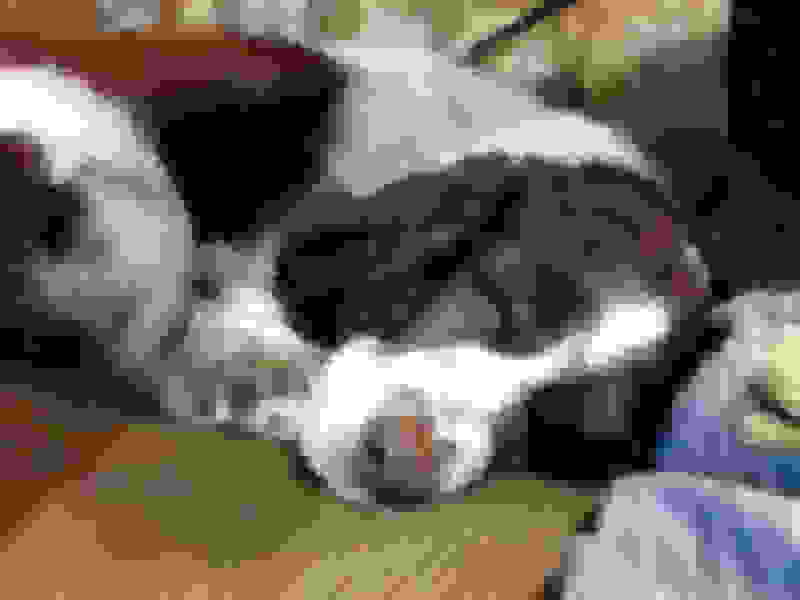 Last edited by THEBEAST84; 05-13-2016 at 06:33 PM. Track down the bolts for my t5 and bellhousing . Is it an 84 ? With gfx ? What colour are you going with ? Pics ? !! 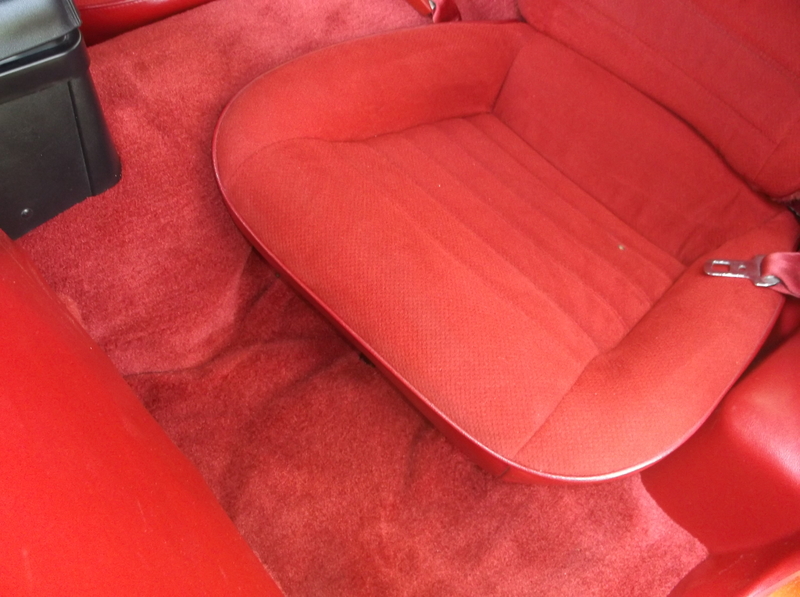 Just removed trim and passenger seat to take up carpet (well stuck down !) For fitting my exhaust hangers through the chassis . Oh yes very nice bud, I like non gfx cars , nice clean body lines. Jon, yeah sounds like egr pipe. Have you done a basic tune ? These cars aint fast anyways ( stock that is ) does it run smooth ? 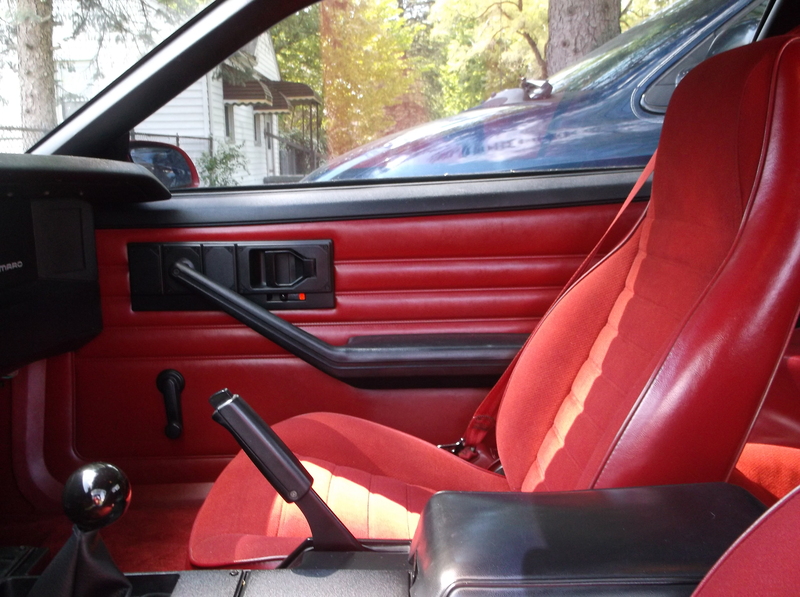 I cleaned all the interior bits that came out of the car. I have to get the center console out, then I can put in the thermal insulation and new carpet, and put the interior back together. Interior is done! 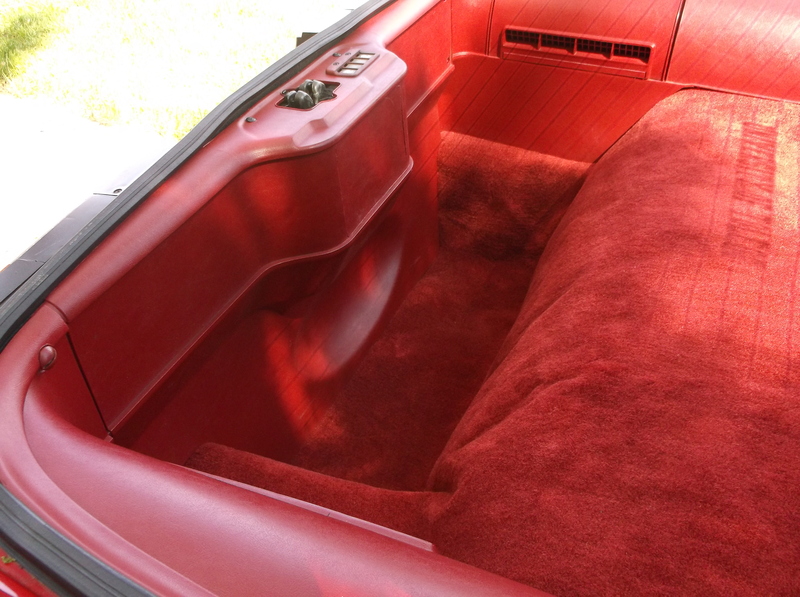 I replaced the headliner and carpet, and cleaned the seats and trim. Looks almost as good as new. Pics to follow, soon I hope. Been offline but last 2 weeks put new shocks and struts, plugs, wires, fuel filter oil and filter. so it's been a productive 2 weeks of upgrades and upkeep. Wow did you do the door pannels? If not where can i get that!!! Looks exelent! Nothing I just write checks to my mechanic. LOL. She does run very well. Thanks for the compliment. I just cleaned them, they were in pretty good shape already. I did use the fix I found on here for reattaching the upper plastic piece to the cardboard. I used duct tape to repair the mounting holes in the cardboard, and they are now pretty solid. Very nice Berlinetta. Is it all original? paint, interior, etc? Very very nice. 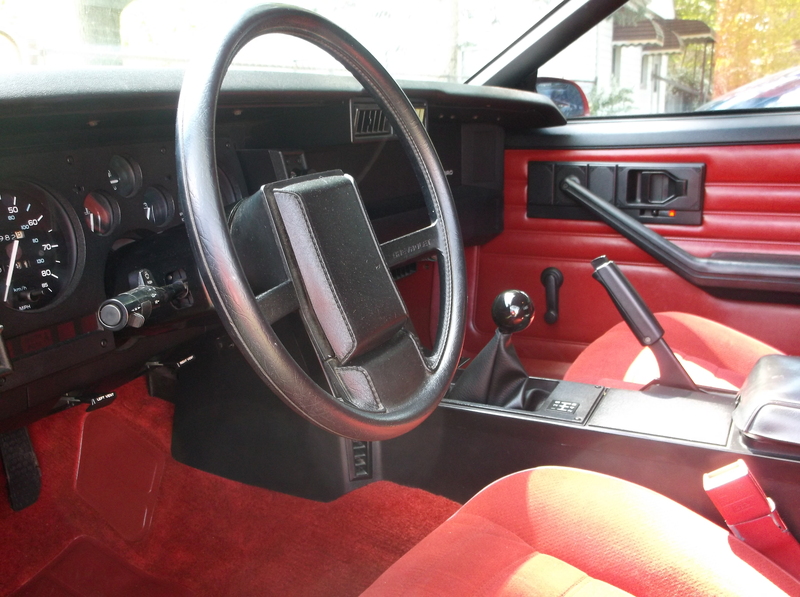 I also have a red interior, no where as clean as that though !! Are your seat bolsters worn at all ? My side bolsters (the foam) was a little worn, so I took the cover off and added some fiber batting to fill them out a bit. 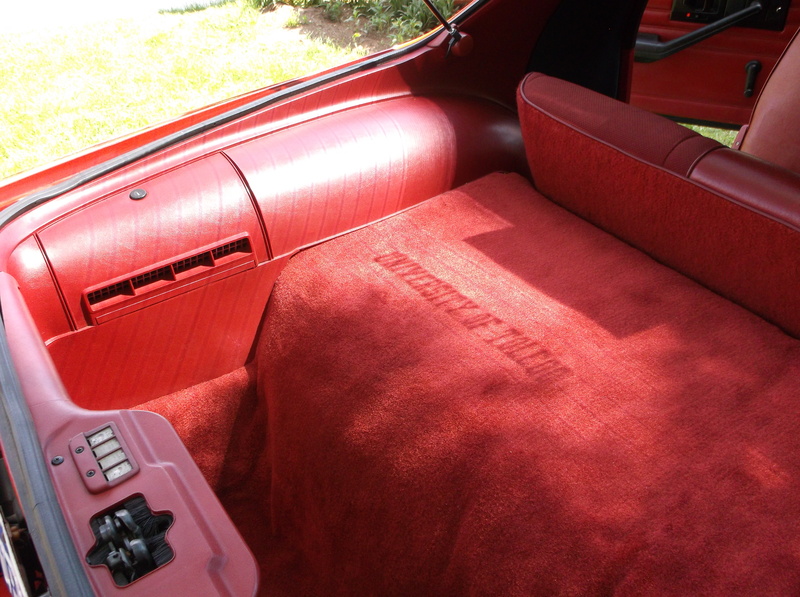 I then hand-washed the covers and put them back on. I then spray dyed them back to close to original color. I think it was Duplicolor, vinyl and fabric spray. They have two colors - bright red and dark red. the dark red is close to the dark carmine original color. It's slightly more purple, instead of orange, when compared side-by-side to the original. But I did all the seats that color, so they are only compared to the pastic trim pieces, which never matched the fabric anyway! After all the work, they may not look like new, but more like well-cared-for. I can live with that. No. 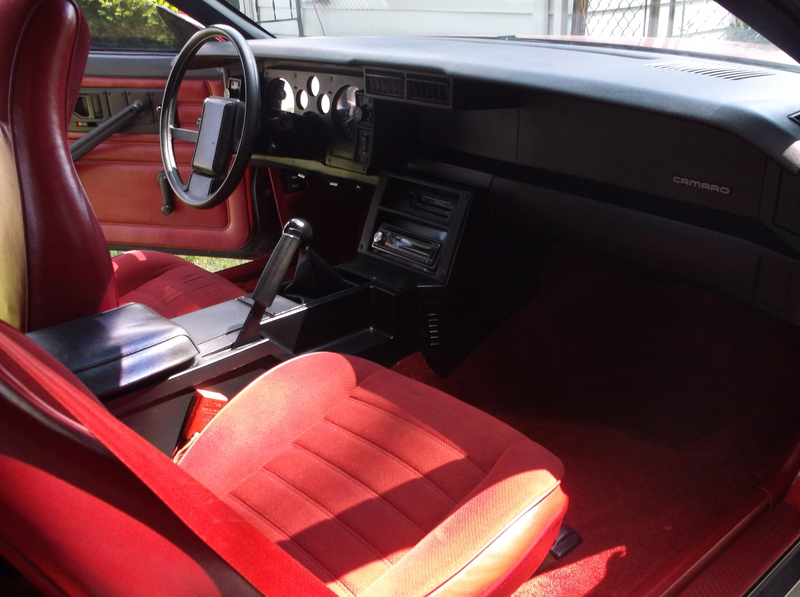 I have had it painted, new stripping, the rims painted and corrosion taken off, interior redone. It has a new windshield. I have restored everything to stock with codes that I could which was most of it. Striping decal was the hardest to match. I found a place that has the original grey charcoal zebra material for the inside. Was a lot of fun. 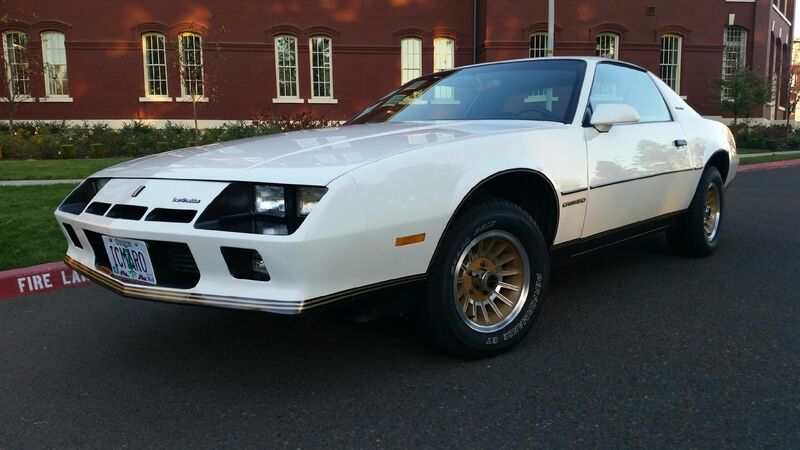 The car was bought new by me in 1984. I always knew I would fix it up. So I did. Sweet fix...solved another problem i was about to change. was thinking of just cutting out metal pannels for the door but this will keep it more original. Thanks! Re hung painted fuel lines, put new exhaust hanger through chassis on passenger side, exhaust off for last welding. Still tuning, have put about 50 miles on the car since the turbo set up. I discovered a heater hose leak in the steel tubes coming from the heater core to the engine. 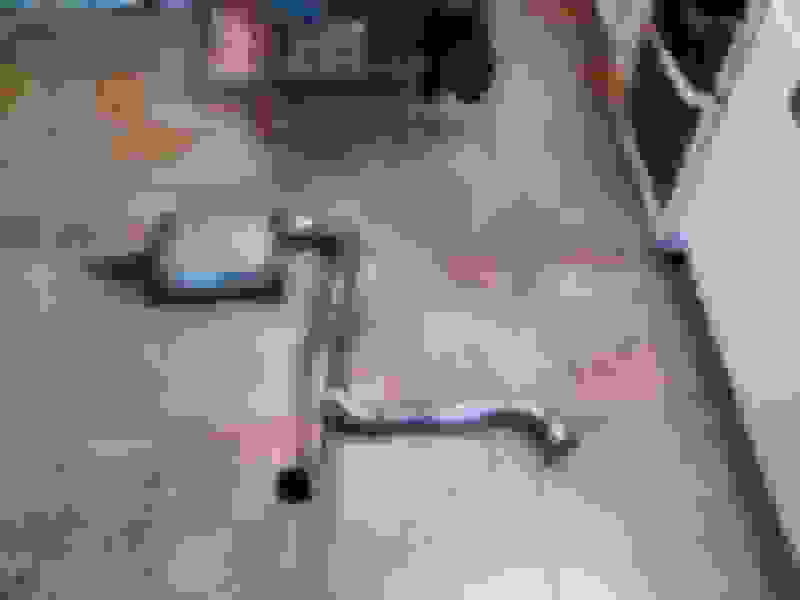 I cut out the rusted section, replaced it with rubber hose, and... found another leak! Different section of the steel tube. so I took out ALL the tubes, and replaced them with lengths of rubber hose. Tomorrow will tell if I found all the leaks. Thats anoying that metal pipe fittment. Mines still good though. Got home to a package with my new shorter non ac non air pump belt. Huhu, today i was reading on how to build a cold air intake system. Currently my baby has an issue with acceleration and idling. I installed new sparkplugs about a month ago. Installed them by the book and everything went dandy except i broke one of the spark plug wires. I repaired the wire, but after that something funky started happening. When i accelerate it sometimes "Coughs" and when my car is angled, it can sometimes shut down (die). I suspect that the spark plug wire is the fault causer, but might be a faulty fuel pump. Either way i was looking for some new spark plugs and a new performance spark plug wires kit. Its gonna cost me 60 bucks to get all the stuff which i am happy. If this doesnt fix my "Coughing" problem i will have to bring it in to a friends place and see if the fuel pump is the problem. Cold air intake system project will launch right after i get the "Coughing" problem out. What have you planned for the cai ? Im going to get one of those filters in a can , 3" in and out, taking air from inside the passenger wing then straight on through to the maff and so on. Should provide a nice coldish smooth airflow. I am currently thinking where to place at as you are. 1 version is to place it at the same place where the stock box is. I am not quite happy with that idea, but at least the base idea exists. One idea is to place 1 in front of the car, like inside the bumper if its possible to bring it there. So when i drive the air the flows from the front speed gives more power to the engine. I am currently thinking on how to build that but i have 1 major problem. How to protect the air filter from water (rain). Because im thinking of building a grill in front of the bumper which brings air in. One idea of course is building the CAI into the hood with a scoop. it would look rad, but obviously some cutting has to be made. I dont want to spend bucks in buying a scooped hood, i would rather build my own one. So I started the arduous task of polishing my badly oxidized paint. I haven't done anything but wash it these past 4 years, and I have no garage. Also, I'm in FL, so the sun is kinda harsh. I'm not anywhere near done, but I am seeing some improvment, at least it looks more blue instead of total washout. I'll post pics at some point, but right now, after two days of polishing by hand, I dunno if I can hold the camera. Well, I cured the leaking heater pipes - I got rid of them! I replaced them with lengths of rubber hose, so no more leaks. then, I was letting the engine get up to temp... then past temp... near overheating... but no fan! I was watching the fan, waiting for it to switch on, when I saw the fan twitch... but not spin. I gave it a push with my finger, and it started to spin. It kept running until the temp came down, then switched off. So, it looks like the fan motor is about dead. I ordered a new one from Rock Auto, should arrive in a few days. Painted one of the wheels today, here is a couple pics. New center caps and trim rings on the way. 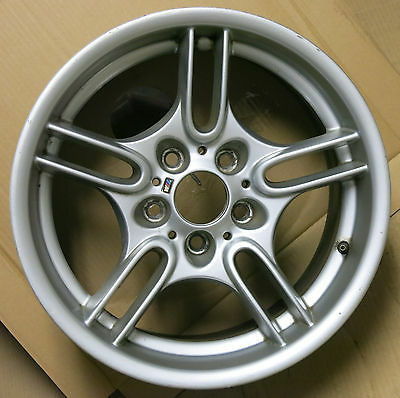 I am looking at these wheels, I have a good offer and I think they will suit the car, simple design with a good rim and a slight increase in size, I will fit chicken centre caps too. Those are nice wheels. 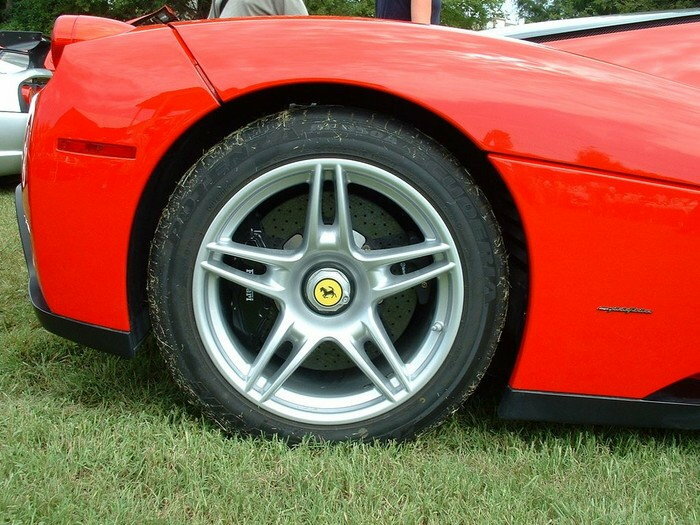 reminds me of a Ferrari Enzo's wheels. What size? Thanks, if I remember rightly not so big and very useable 17 x 7.5 and 8.5 could be an inch wider though. Edit there 8 and 9 inch wide. 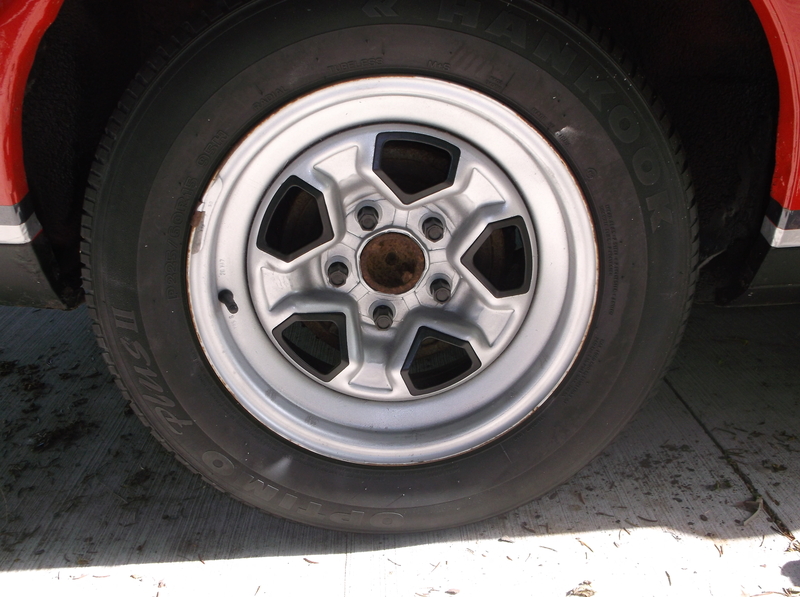 They are on a friends car, hes found a set of nice rims his wanted for a long time, I like these so we started talking about putting them on my car, they pretty much go straight on. Last edited by zs&tas; 06-01-2016 at 03:21 AM. Good call on the enzo !! Hmmm... $2 million Ferrari? Not a bad car to take inspiration from. good luck with the trade. Those wheels would look great for sure! Honestly guys a cold air intake won't help as much as most people think it will. Plus most times they just look gaudy. Hmmm... $2 million Ferrari? Not a bad car to take inspiration from. What are your trim rings made from ? Stainless would be sweet. I am getting them from Camaro Central. Part number WHE-68. Chrome plated stainless steel. On the truck, should be arriving later today. Hopefully will bling up the car nice. 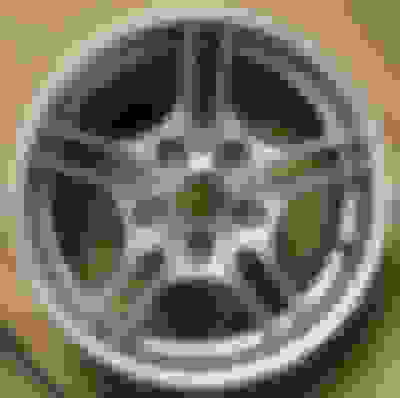 Also got another wheel painted today, looks the same as the first one, so I didn't bother with a pic. Today had to fix the tps. Car was running like shiz. checked it and 7.6! So i put it back to 5.4 and readjusted the ide again. Now she purs again. Also, had 2 great deals on tires in a week. Guy had 2 brand new tires Goodyear eagle f1 ( $245 ) for $40 and a Fuzion ZRi for $80. 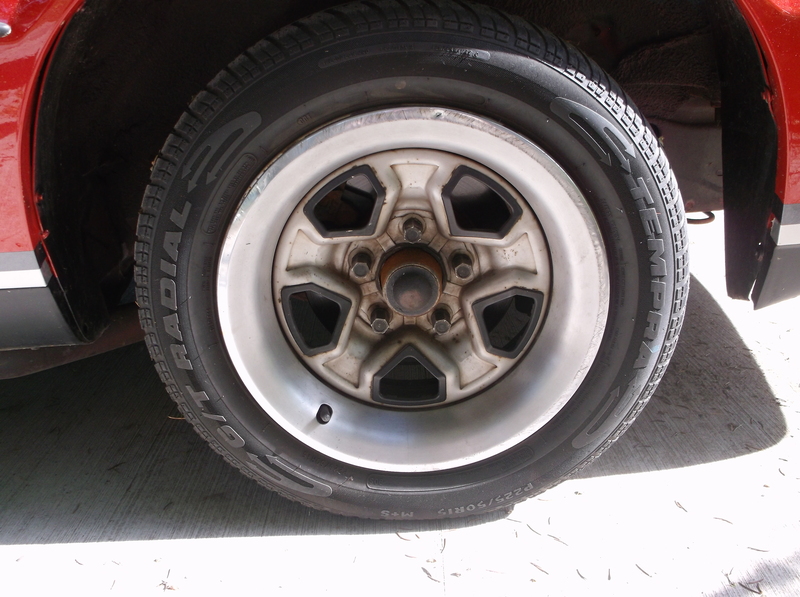 Always good to have a spare for my 245/50/R16 gta rims! Just about finished my exhaust this the header back section. I got my trim rings from Camaro Central, and... they don't fit!!! Dang it! Trying to prepare for a car show next weekend, now looks doubtful. These rings are 2 1/2" deep, compared to original at 2" deep. Gotta wait until 9:00 to talk to Camaro Central. Well I have to wash it today and mess with the tune some more. Getting there for sure!